I just updated my laptop to Windows 10 (hip hip hooray! ), and it works like a dream…too bad I have no clue how to work around this stuff. I’m used to Apple systems (I haven’t strayed from the iPhone in over 6 years); this new app-heavy Windows/Android system is like a foreign language to me. Plus, it took almost 24 hours to update this sucker to Windows 10. I guess I’ll get used to it someday, but for now I’m going to stick to the internet (Microsoft Edge???) and continue blogging. The other day, I felt like making something different. I’ve been on my squash kick since fall is around the corner, but I’m slowly growing sick of squash. I had everything at home to make this new stir-fry recipe, so I gave it a shot. Surprise! It was delectable. I had every intention of making enough to take with me to work for the week, but only ended up with leftovers for one day. Flavor Description: I love how the Thai peanut sauce contrasts with the earthy taste of the mushrooms & carrots. 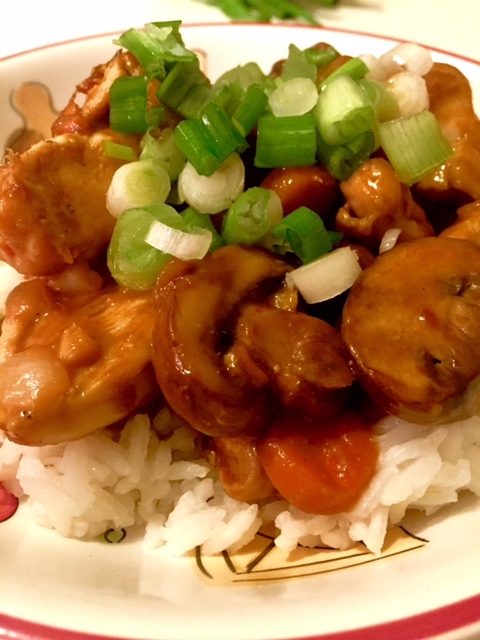 Top with some green onions and lay over a bed of rice and you have this creamy, spicy, sweet stir-fry. Thai food typically hits all sorts of flavor profiles and this meal was no different. 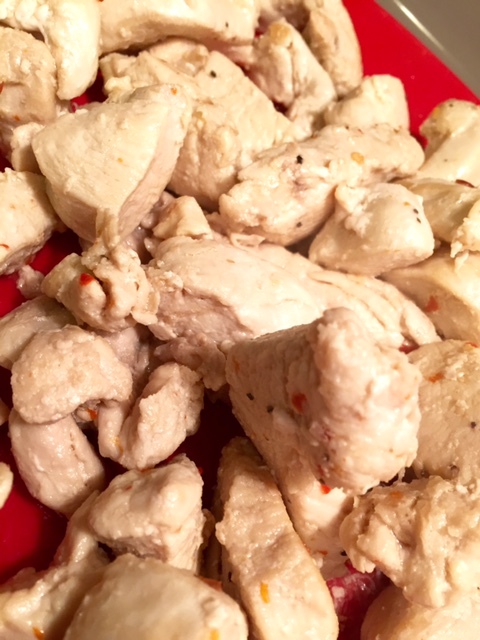 I added some crushed red pepper flakes to the seasoning on the chicken and in the sauce to give it a spicy zing. Skill Level: It’s very easy to make. The most time-consuming & difficult part was cutting vegetables…and since it’s a stir-fry, the veggies don’t have to be very pretty. Chop, hack & mince those suckers! Whichever is comfortable for you. Just remember to cut them into bite-size pieces. Even an amateur cook would be able to put this meal together. Also, you don’t have to make the rice—you can use boil in a bag. The rice is just there to add starch and soak up that delicious Thai peanut sauce. Time: About 1 hour, including prep. Versatility: If you don’t like mushrooms, take them out! You still get the Thai stir-fry without them. Don’t like spicy? Don’t add crushed red pepper. Want to make it paleo? Well, it pretty much already is, unless you’re super-paleo and don’t believe in nuts. Tahini might be a decent substitute for the peanut butter. Don’t eat it with rice. Boom! Paleo. Vegetarian? Vegan? 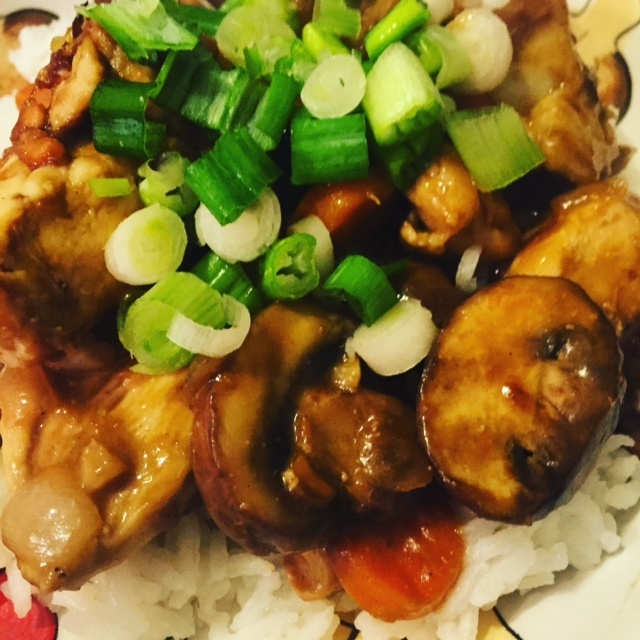 Say bye-bye to the chicken and you have yourself a Vegan Thai Stir-Fry! Maybe add some sliced red bell pepper, bean sprouts, and cauliflower. Delicious. 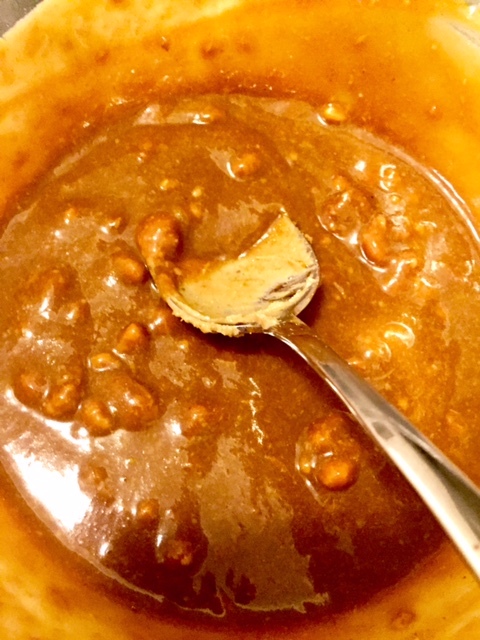 In a small bowl, combine the peanut sauce, teriyaki sauce, peanut butter and Worcestershire. Add 1 TBS. crushed red pepper flakes. Set bowl aside. 2. 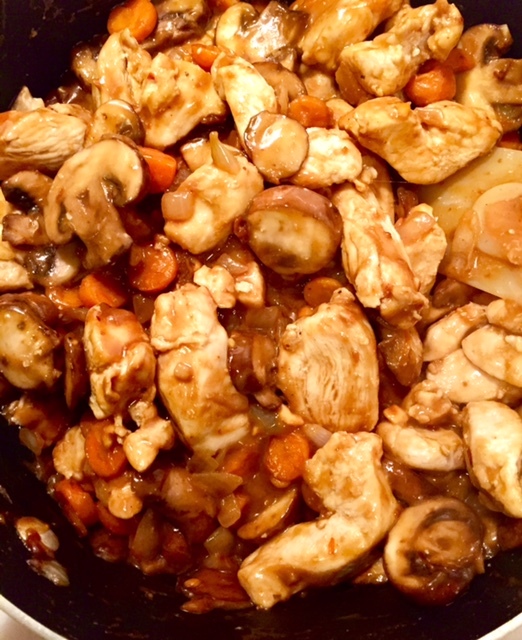 In a large skillet or wok, stir-fry chicken in 1 TBS. olive oil and sesame oil until no longer pink. Add 1 TBS. red pepper flakes near end of cooking. Remove and keep warm. 3. 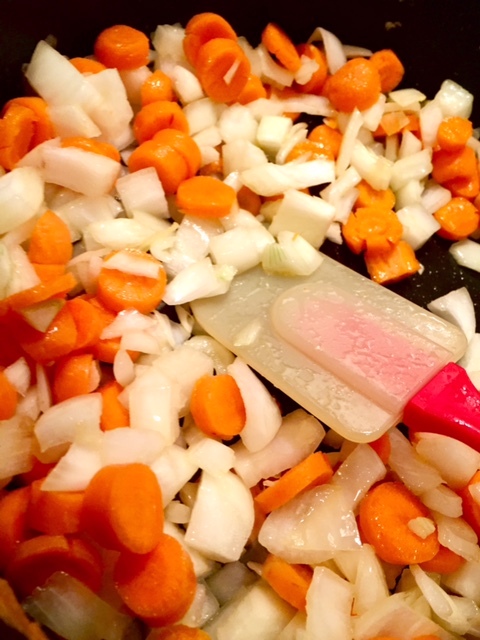 Stir-fry sweet onions and carrots in remaining oil for 4 minutes. 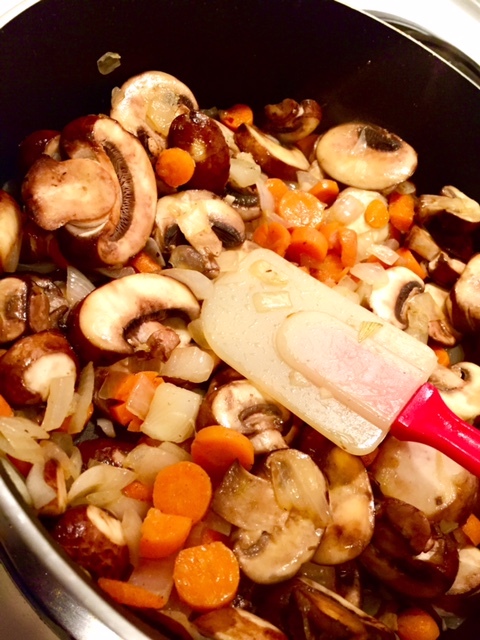 Add the mushrooms, ginger and garlic; stir-fry for 4-6 minutes or until veggies are crisp tender. 4. Stir sauce mixture and add to the pan. Bring to a boil, cook and stir for 2 minutes or until thickened. Add chicken and heat through. Serve over rice and top with sliced green onions.